The ABCs of brake line plumbing, and what you need to haul that Ford down. A disc brake upgrade and dual master cylinder upgrade are some of the most common discussions amongst Ford owners. The most misunderstood ingredient of these swaps is distributing the brake fluid out to each wheel. When upgrading the brake system, it can be extremely dangerous to distribute brake fluid incorrectly. Correctly matching the master cylinder and distribution block to the braking system is very important. 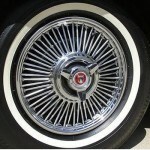 When upgrading the brakes on a classic Ford, be sure to study how the system should be installed correctly. When buying new components, be sure they come from a reputable supplier and purchase a complete system, not just components. 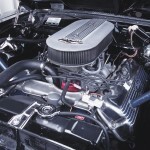 If upgrading by using later model Ford components, get the whole system from the donor vehicle. 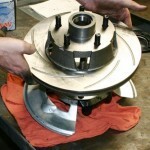 When replacing front drum brakes with disc brakes, brake plumbing immediately becomes more complex. Disc brakes operate with out any springs pulling back the contact surfaces (pads) and therefore disc brakes react more quickly to pedal pressure. Rear wheel cylinders will leak if they are not fed a constant low level of brake pressure. The seals in the wheel cylinders need this pressure to seal against the bore of the wheel cylinder. vehicle has four wheels. Something has to be used to get 2 to feed 4.
proportioning valve reduces fluid pressure to the rear drums to prevent premature rear wheel lock up during hard braking action. Incorrect reduction in pressure does not show up on high traction road surfaces or nice easy stops, but let the road get a little wet and a heavy application of brake pressure could have you quickly facing the wrong way. 3. 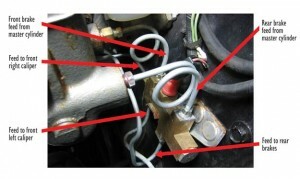 Pressure differential sensing – When dual master cylinders were mandated for safety reasons by the government in 1967, they also required a warning light to indicate a loss of brake pressure if either side failed. The combination valve has a piston that when centered (equal pressure to each pair of wheels, front and back) is in the off position. If a pressure difference develops (because of a fluid leak), the piston will slide towards the leaky side and send current to a warning light that indicates a failure in one side of the brake system. stopping distances are not optimized. Not all combination valves include a metering valve function. Ford combination valves that have a metering function can be identified by a bleeder valve. Drum brakes require 6-25 psi be maintained in the brake circuit to keep pressure on the cup seals. Without this constant pressure, the wheel cylinders will leak. 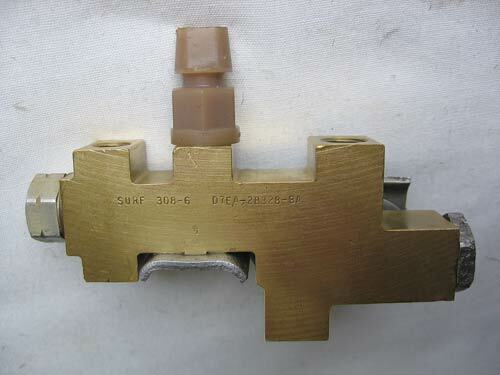 Ford built the residual check valve into the master cylinder prior to disc brakes. 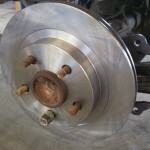 When Ford added front disc brakes, the residual check valve was removed from the disc brake circuit, but it is still used for the rear drum brakes. Using a master cylinder on disc brakes that has a residual check valve in the circuit will cause the front brakes to drag. Selecting the correct master cylinder for your braking system is critical for safe braking! To activate a braking system, a given volume of brake fluid has to be moved from the master cylinder to the calipers and wheel cylinders. Just like engine displacement, master cylinder volume is equal to the bore times the stroke. If you use a narrow diameter master cylinder, you will need more stroke to achieve the necessary volume required to activate the brakes. The longer the stroke, the easier the pedal will push. Conversely, with a larger master cylinder bore, the stroke will be shorter. A large bore master cylinder requires more pedal pressure than a narrower master cylinder. This is what differentiates a power brake master cylinder (larger bore) from a manual brake master cylinder. 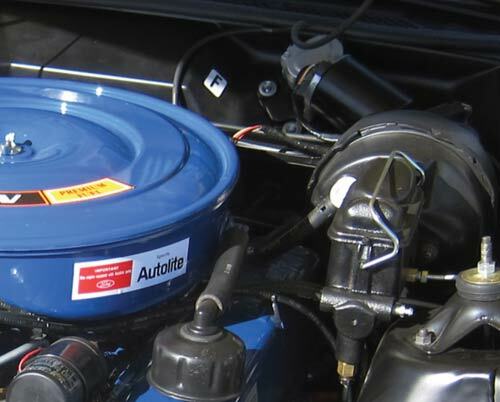 Dual master cylinders have two reservoirs for brake fluid. With four-wheel drum brakes either reservoir can supply the front or rear brakes. With front disc brakes and rear drum brakes it is important the reservoir design for the disc brakes feeds the disc brakes. The typical Ford master cylinder of the late 1960s and1970s has the larger reservoir in the rear (nearest the brake pedal). The larger reservoir is for the extra fluid requirements of the disc brake. 1. Buy a complete system from a reputable manufacturer, or if using a later model donor, get the complete system. 3. Be certain that you have the correct master cylinder for your application. 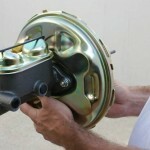 1976 Ford combination valve installed on a 1963 Falcon Sprint with Granada front disc brakes. Master cylinder push rod length: upgrading a pre-1967 single reservoir master cylinder to a dual reservoir master is an excellent idea to add safety to an often-driven vehicle. One additional precaution when doing an upgrade is to be certain that the push rod length is kept at the original length of the vehicle being modified. 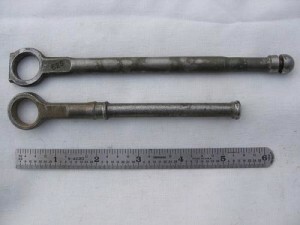 Push rod lengths vary. If too short, there may not be enough travel to activate the brakes. If too long, the brakes may never fully release. The Internet is a wonderful source of information; unfortunately, in many cases the authors credentials are unknown. The same can be said of Internet parts suppliers– are the parts offered for racing purposes or are they for street applications? If you are driving a car with a modified braking system, will it perform under a panic stop in poor traction situations (rain)? Adjustable proportioning valves are readily available. This is installed on the rear brake circuit and the pressure is adjusted to attempt to balance the front to rear braking. If close attention was given to the description of the function of metering, proportion and check valves in a braking system it should be understood that randomly turning a dial to balance front to rear brake pressure is risky at best.